Drinks International’s annual Pre-Mixed Drinks Challenge reflected the fast pace at which this sector is growing. Shay Waterworth reports. THE EIGHTH EDITION OF the Pre-mixed Drinks Challenge witnessed a series of surprises across the ever-expanding category, with fewer medals being awarded from the same number of entrants. According to Euromonitor International, the pre-mixed cocktail industry has continued to grow consistently over the past few years, adding around 2%-3% per annum. Convenience and accessibility have a large role to play in this upward curve. The idea of buying one item rather than a basket of ingredients from a supermarket has a large appeal to consumers on the move. This year’s judges gave a wider scope of perspectives than ever before in the competition, covering the media, bar owners, buyers and bartenders. The tasting was held at The Hide bar in London, which specialises in local beers, wines and spirits. Bar owner Paul Mathew was invited to join the panel of judges, which consisted of Richard Applegate, buyer for Marks & Spencer, Elliot Ball, co-founder of Cocktail Trading Company, Nick Bell, retail general manager at Amathus Drinks, Michael Vachon, head of brand development at maverick Drinks and Drinks International’s Shay Waterworth. There were just four gold medals awarded, including the supreme champion, which was placed on the shoulders of The Negroni Cocktail by Handmade Cocktail Company. 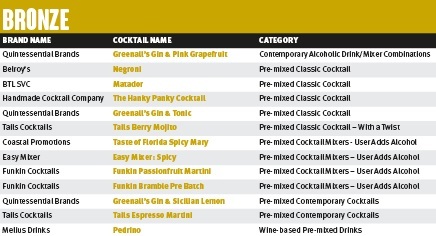 The Negroni narrowly outshone Blue Marble Cocktails’ Bloody Mary, leaving Quintessential Brands’ Greenall’s Wild Berry Gin & Tonic the only other gold medallist from the day of tasting. Among the silver medallists, the Croft Twist – sitting in the Wine-based Pre-mixed Drinks category – impressed judges with its authentic taste and pleasant mouthfeel. The category which struggled the most this year was that of User Adds Alcohol, which produced just three bronze medals and one silver in total. Crooked Beverage Co went away with a medal in the Design & Packaging section, and it was a gold one too. The alcoholic soda brand impressed the judging panel with the artistic and unusual designs which cover its 33cl cans. Despite the fewer medals, the quality within this growing category is certainly there, and every year it seems a different style of cocktail emerges stronger. It feels like a game of roulette, going around keeping us on our toes.